OLD PARKED CARS. 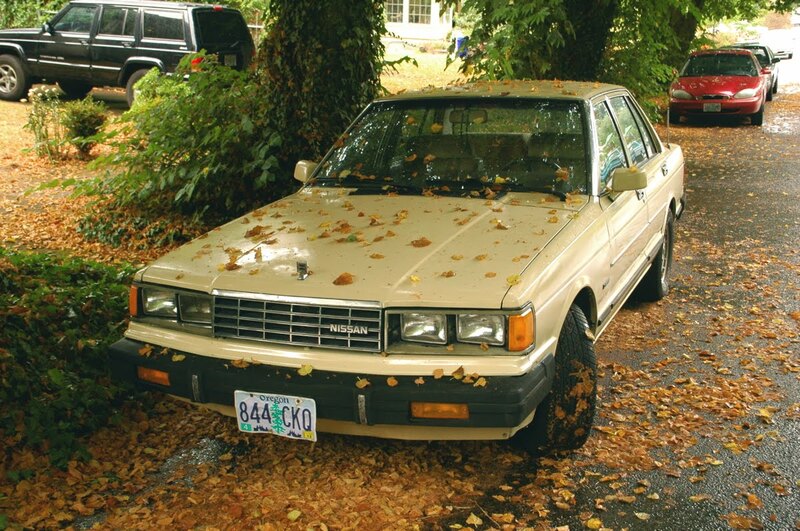 : 1982 Nissan Maxima Diesel. Wasn't this car sold as the Bluebird in Europe? Coz it sure looks like it. There's an interesting selection of cars in the background, too. I see a Mercedes-Benz W115 and a W124 there. yeah, we were there to test-drive that blue '77 240d. it was a super cool rig, 4spd and set up for bio. but the paint was just too tired for my wife, and she wasn't smitten with truck-like feel of the diesel manual. 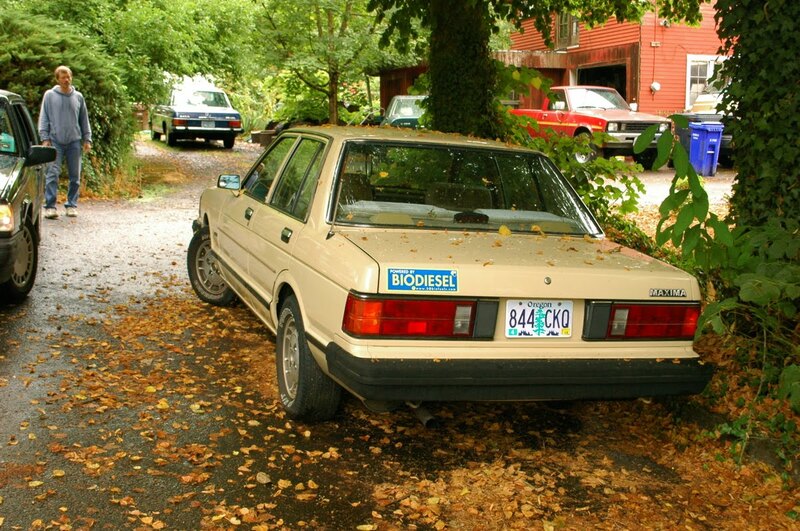 dude loves his diesel. the red pickup is a bio isizu p'up, and the maxima is his daily driver. Wow. Never even heard of a diesel Maxima. 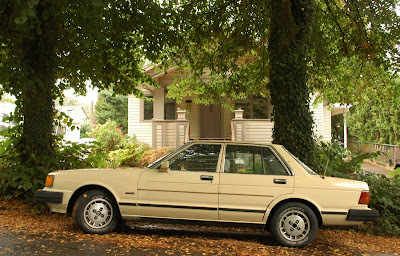 Is it just me, or does Portland have a ton of old cars that are still being used as daily drivers? Being from Santa Monica, most of the old cars here are over-the-top restored and used very rarely. But it's great to see these cars put to use! Did the guy say how many miles on the Maxima? I bet it's been around the block a few times! That's about as handsome as 1982 got. I love the slim grill and front end, makes the car look a lot more low and sleek. I doubt this, but does anyone know if you can make a decent hypermiler (over 30mpg) out of early 80s diesels? Diesel Rabbits of the late 70's and early 80's were known to exceed 50 mpg on the highway. How cool is this..found my cars on the web...and being one of my fav subjects thought I would answer some of the questions..The 82 Diesel Maxima has the ld28 diesel, the one that with a slight oil pan mod will bolt right into the early z cars, the Maxima has 52k for real miles on it and drives like new, bought it from a "very" buddhist soul. I average between 35-40 mpg depending on freeway or city. The w124 is the last of 124 series E300D after a 10 year run of that model and was the last year before Mercedes became a accountant driven car company from an engineering one (The following years had lots of computer, electrical and engine issues till Mercedes came back to their senses some years later). It has the indestructable om606 engine that literally runs until the car falls apart (400k on some that are still going strong). The pickup is a 83 Mitsubishi "Mighty Max" with the 4d55 engine, lots of torque and 4 whl drive. And finally the 240d (The one that is always being talked about as million milers as taxis in third world countries) which after getting a good offer on it, realized I couldnt sell it (Yes, Tony you are right I love diesels). It is the most classic of the cars and I have decided that it will make a great "old man" cruiser car for when I retire someday, so new paint will be splashed on it soon. 35-40?! If they ever offered a 5 speed, I would buy one! Heck, my mind is already turning about how great a 5 speed turbo diesel Maxima wagon with a LSD would be, that's what I'm talkin about! Is the interior as cush as I imagine it is?